Friday night as we were about to goto dinner, my wife tells me that she sees some water running down the driveway. I took a look, saw a pool of water near the water shut off, shut off the water to the house and asked her to call a plumber. After I turned the water off, I could still hear the water running, so I knew there was an issue between the house and the street. I shut the water off at the street and the fun began! The plumber took a look and gave me an estimate; as he would have to chop out concrete on our front patio, it wasn’t going to be cheap. The next morning, the plumber, Brandon, arrived, and started jack hammering the concrete. After a little while, he knocked on the door because he had to show me the problem. 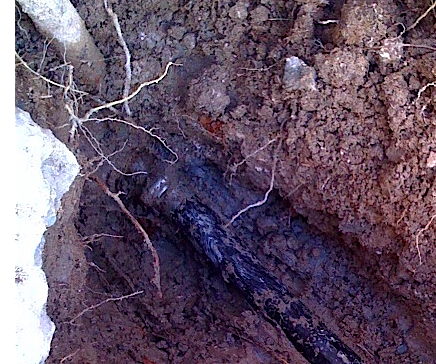 It looked like a rubber hose was connected to our main water line. This, obviously, wasn’t up to code. After a lot more jack hammering and digging, Brandon couldn’t find the other end, so he gave me an estimate on running a new main water line. Brandon asked if we had Quest piping in the house; this type of pipe is polybutylene, it was only used between 1978 and 1995. Our house was built in 1973, so it wasn’t used originally when the house was built. While Brandon was digging and jack hammering, I did more research on polybutylene pipe and became convinced that what we saw was polybutylene and at some point, a repair had been done and instead of putting back copper, a cheaper alternative was selected. Around 3 pm, I saw that it was going to take Brandon awhile to dig the trench to the straight and I wanted our water turned back on, so I offered to help. Well, we didn’t finish the trench, but Brandon duct taped the broken pipe and put a rubber coupling on top of it in hopes that it would last enough for a few showers (you really didn’t want to smell me after digging for 3 hours). I went instead to say goodnight to my son, turned the water on and quickly realized that the temporary fix wasn’t going to work; water pressure dropped almost immediately. I ran outside to find water shooting in the air. I went into the garage, looked around to see what I had and found some PVC. I cut the PVC lengthwise and grabbed some zip ties. I put one side of the PVC on the top of the pipe and the other on the bottom and zip tied it altogether. That managed to hold for 2 showers and then I shut it off. Sunday came around and we managed to lay the pipe and Brandon got a chance to do some plumbing! Who knew that plumbers had to be ditch diggers, tree trimmers (Brandon had to cut a tree root), and concrete destroyers. So while we now have water restored, I have to get concrete poured to patch the front patio; at this point. I’m not sure that I want to undertake this as we’ll have to get some tiles replaced and who knows if it will match and if the concrete pour will be level with what we have. The amount that this cost me reminds me of a Fraiser episode where Niles Crane is talking to the plumber about cars and the plumber said that he was getting rid of his BMW, the same model that Niles has. Niles asks why and the plumber said that he upgraded to the next bigger model of BMW which makes Niles mad because he can’t imagine a plumber making more money than he. I know how much work went into this and with any plumbing problem, you really don’t have much of a choice. That does not sound like fun way to spend the weekend – dealing with inherited problems. We just went through a similar episode with the water softening equipment here – bad decisions on the part of previous owners that I had to deal with.